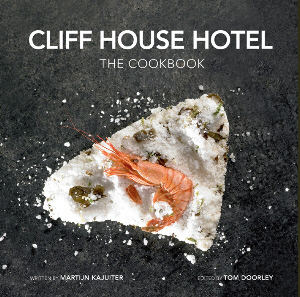 Cliff House Cookbook – A great Birthday present! Susan got me this cookbook for my birthday, and at first I thought it was the Cliff House in San Francisco. Then I realized, no, this is a Cliff House in Ireland, and the chef is the former chef of De Kas in Amsterdam, Martijn Kajuiter, who now has a Michelin star. 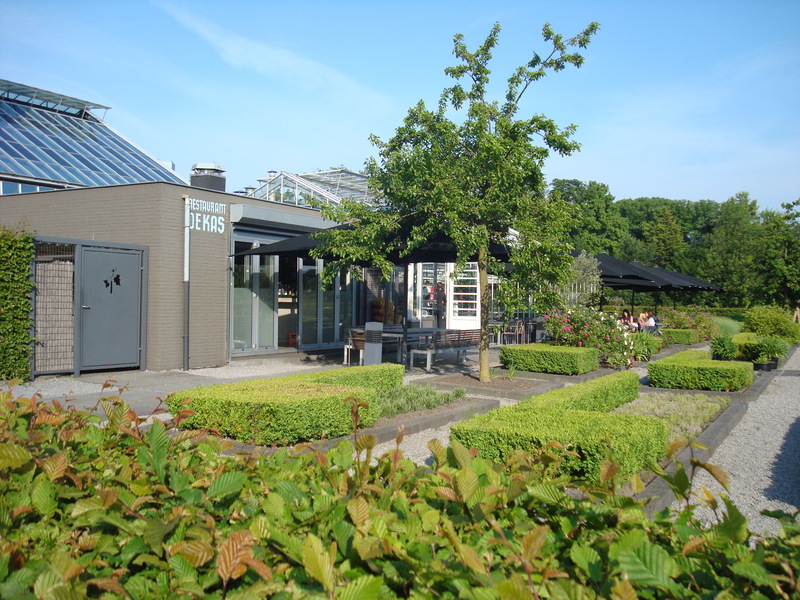 We were so impressed with De Kas! I just thumbed through this book last night, and it looks wonderful! Very creative, out of the box ideas on how to optimize the flavor of wonderful food. Can’t wait to use it. This is a nice summer evening salad, with a really different dressing, and a bit of richness added by the fried goat cheese. 1 tbsp oil and 1 tbsp butter. Slice the cheese into 8 (1/2-inch-thick) slices. (The easiest way to slice goat cheese is to use a length of dental floss [note- if your floss is flavored – rinse it off first!]) Dip each slice into the beaten egg whites, then the bread crumbs, being sure the cheese is thoroughly coated. Place the slices on a rack and chill them for at least 15 minutes. Heat oil and butter in fry pan, and cook chilled cheese medallions quickly, to just brown the outside, but not melted inside. Muddle the strawberries and rosemary and let sit for a few minutes. Stir in mustard, lemon juice, honey, vinegar, salt & pepper. Whisk while streaming in olive oil. Toss dressing with greens and pile on plates. Add sliced strawberries and cherry tomatoes. Add Chicken, sliced, so that the form of the original breast is still kept. Add goat cheese medallions. Garnish with nuts. Serve a bit of extra dressing for people to drizzle on. 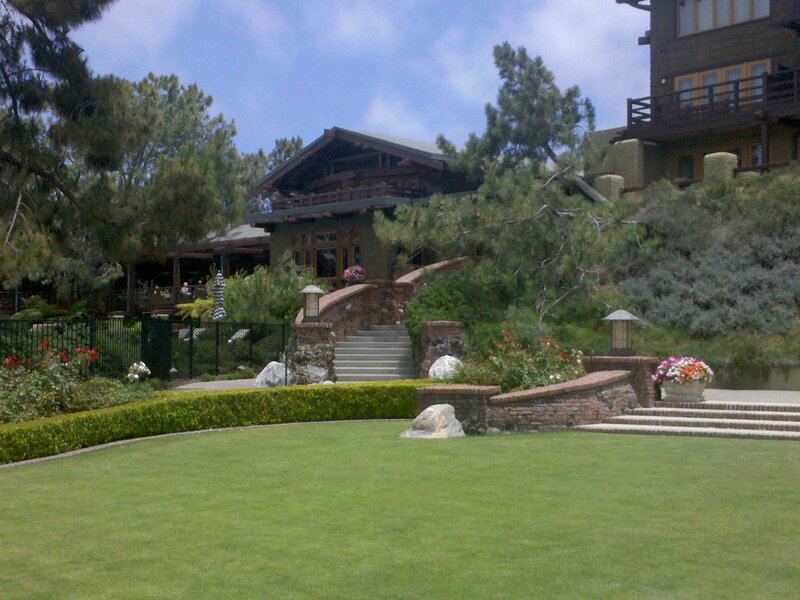 A R Valentien at the Lodge at Torrey Pines in La Jolla is my favorite San Diego area restaurant. This past weekend, I was only able to get there for breakfast, and it was perfection. Valentien is a locavore’s dream, sourcing the highest quality products from as close to home as possible, and doing simple things that make the food amazing. They even use California Olive Oil (note to self – buy CA, not imported). 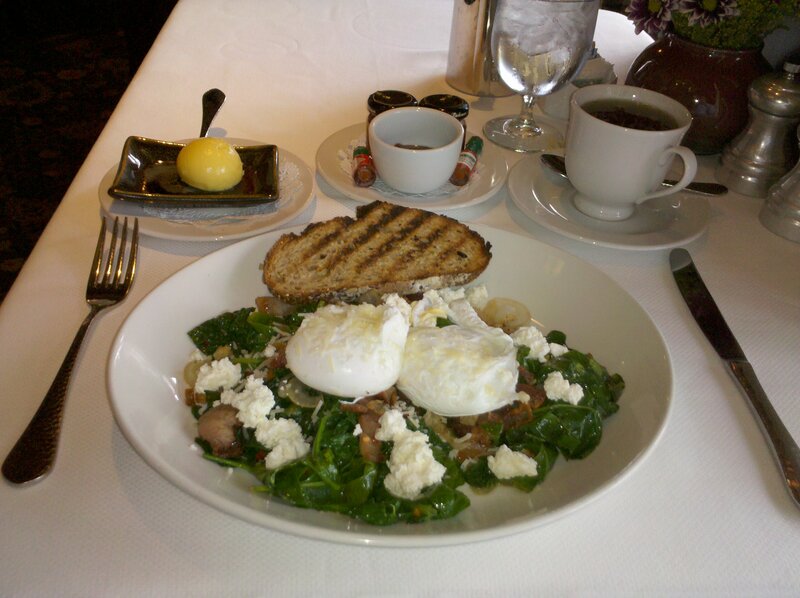 This is wilted bloomsdale spinach, with pancetta and cipollini, Eben-Hauzer poultry ranch poached eggs, and house-made ricotta. 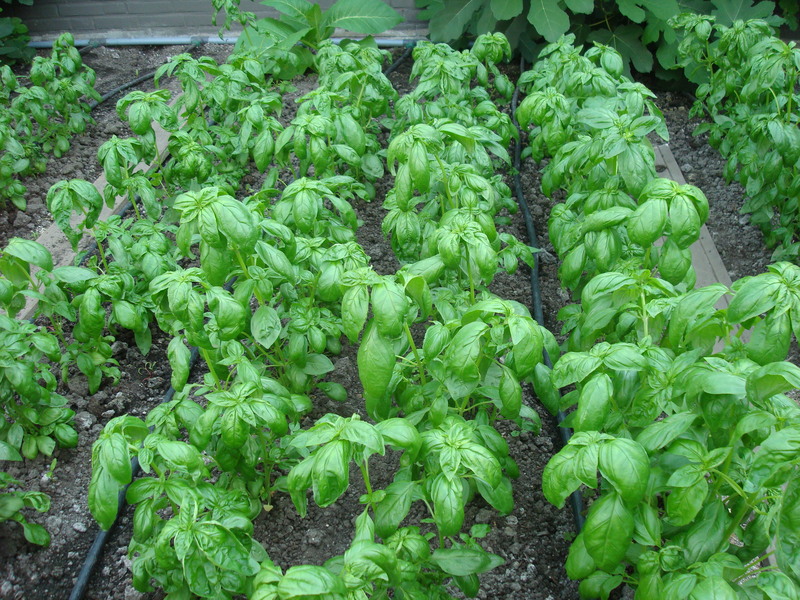 The minimal sauce used to wilt the spinach was spicy and tangy. The golden blob to the upper left is organic butter, and next to that is rosemary infused strawberry jam. The only problem was the one piece of delicious whole grain bread. That piece needed to be used to sop up the yolk and sauce! They happily gave me another slice, which got the butter and jam. The jam inspired me to make a rosemary infused strawberry salad dressing that came out great. That will be a separate post. 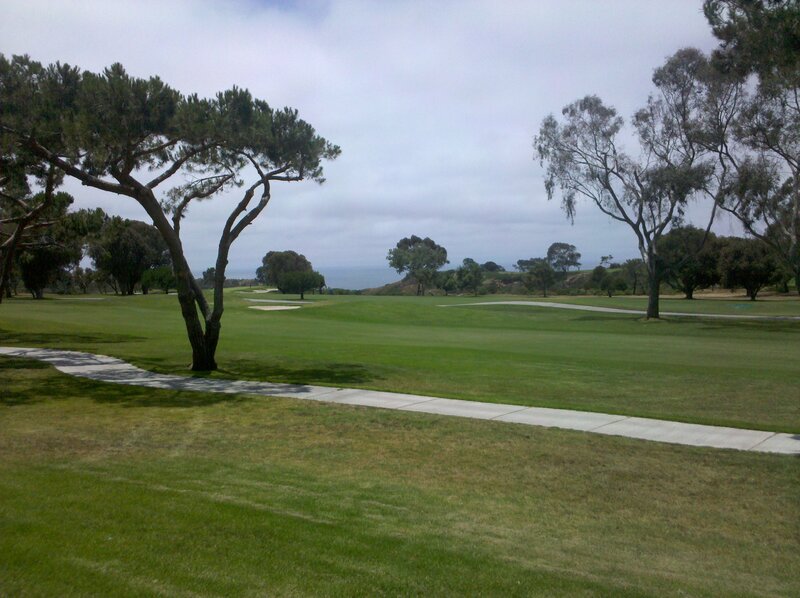 No extra charge for the view of the ocean through Torrey Pines Golf Course, or for the incredible Craftsman architecture of the Lodge. I feel richer every time I walk into this place! We don’t cook meat all that often, so when we do, I like it to be really flavorful. Mix all ingredients and put them in a large zip lock bag with the steaks, marinate for 3-4 hours. When you put the steaks on the grill, salt and pepper them. Grill on highest heat for about 2-3 minutes per side (depending on thickness) to achieve a crust while still red inside. 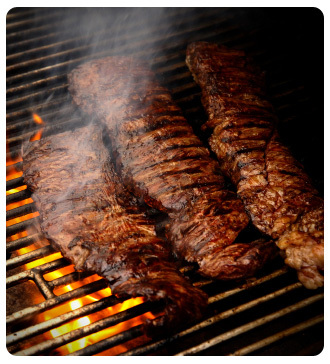 Put the meat on a large platter and tent with foil for 5 minutes to set the juices, then slice across the grain. We pre-roasted little red potatoes (small grill – you can grill these on grill or in foil) tossed with onion, garlic, rosemary, olive oil, salt and pepper, plus a foil wrapped pouch with asparagus, broccolini, scallions, and a drizzle of olive oil. 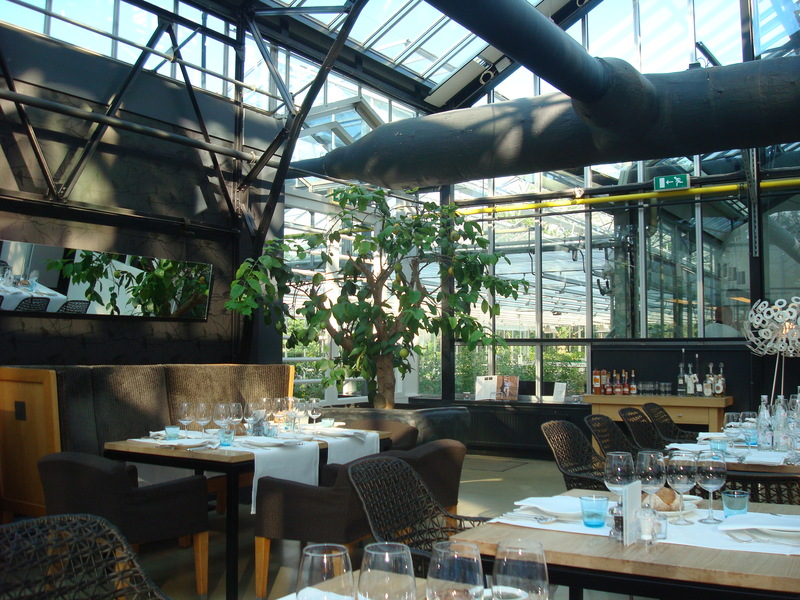 DE KAS (The Garden) is a gorgeous greenhouse restaurant at the edge of a beautiful park, way on the eastern outskirts of Amsterdam. We’d read about it, and when the concierge recommended it, that was an easy decision. They specialize in local and sustainable food, and grow many of the things they serve, both right on site, and nearby at a mini-farm. This was our last meal in Europe this trip. So, of course, we went with the TASTING MENU, with the wine pairing. On the table are a lovely crusty bread with fresh basil dipping sauce, minimally cured olives (from Italy), and pickled turnips. All were delicious. 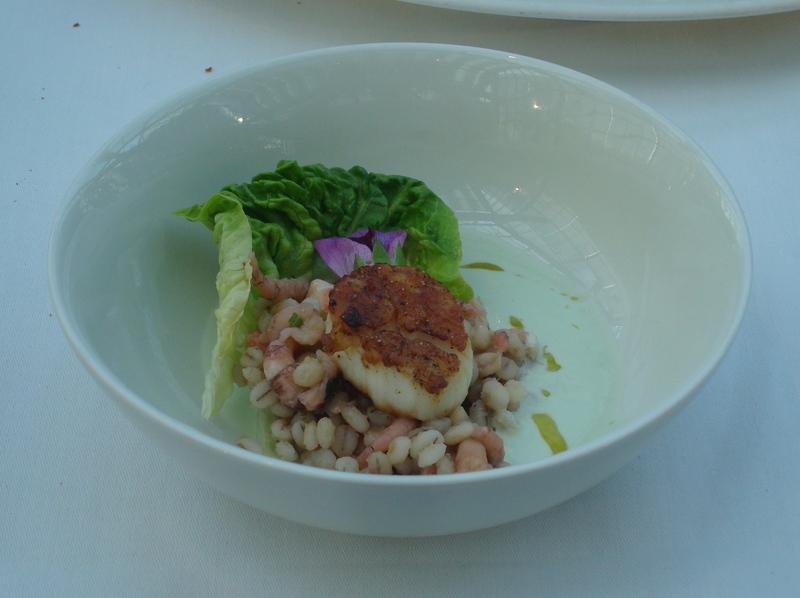 First Course: 3 first courses are served together: Scallop with shrimp and barley, with cucumber yoghurt. 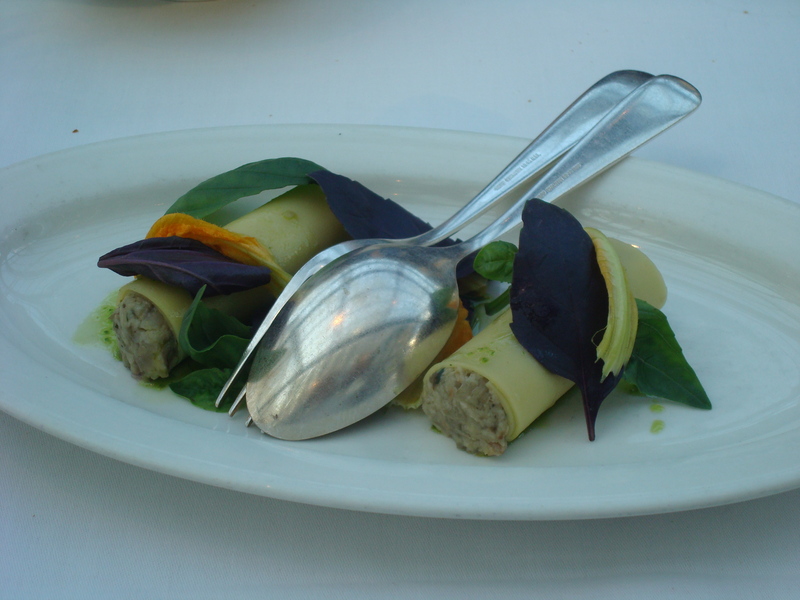 Canneloni stuffed with eggplant, garnished with zucchini blossom and purple and green basil. 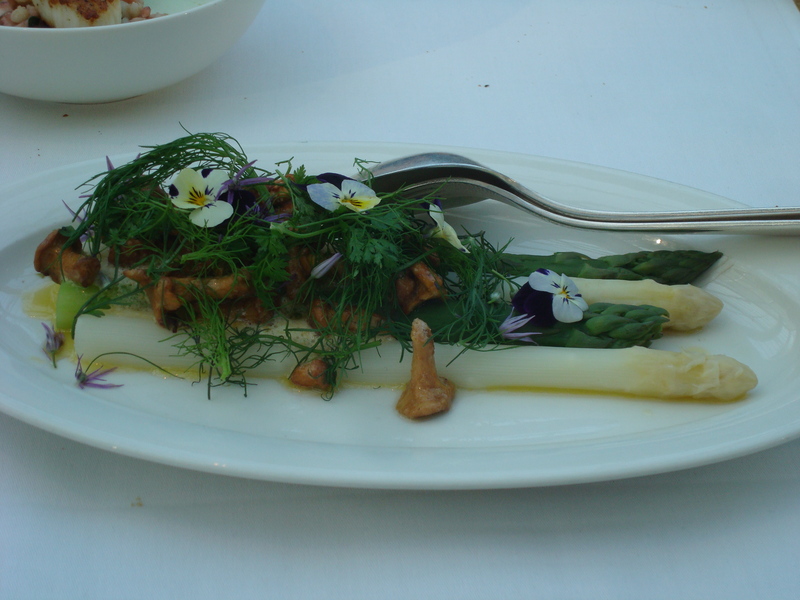 White and Green asparagus with chanterelle mushrooms, butter sauce, flowers and fresh fennel fronds. All exceedingly fresh tasting and simply prepared. 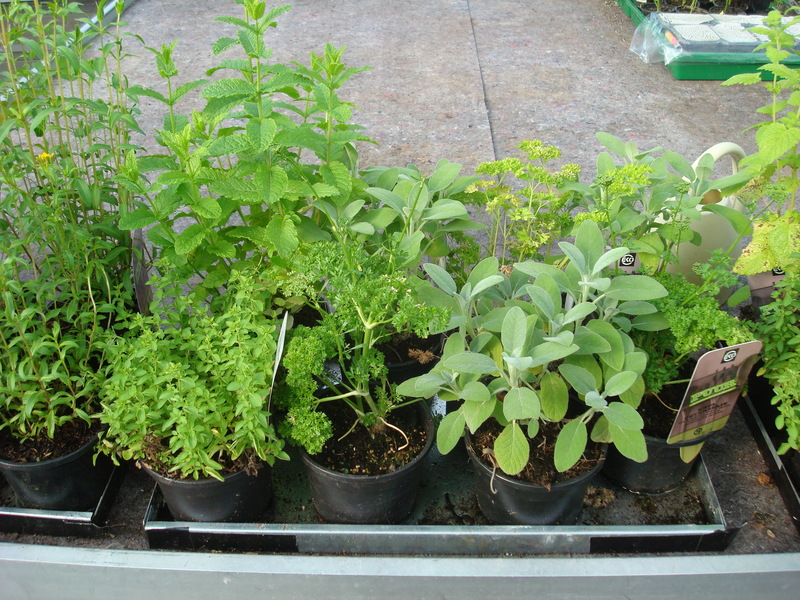 Herbs have a delicacy and tenderness that comes with being just picked that day. Served with Gobelsburger Kamtal, a Reisling from Austria. 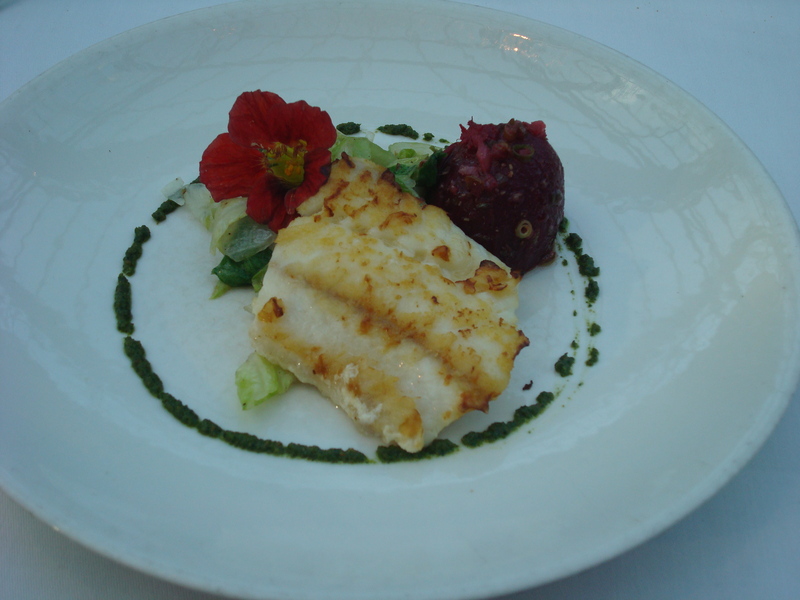 Main Course: Wolfish from the North Sea, with beets, veggies, pesto, fresh flowers, braised cabbage. 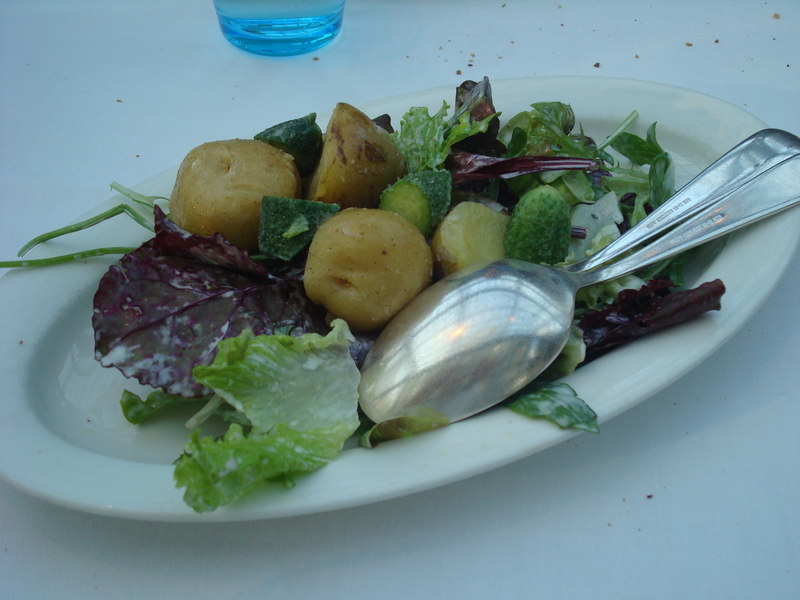 Served with tiny pickled cucumbers, cold potatoes on greens. This was all fantastic! 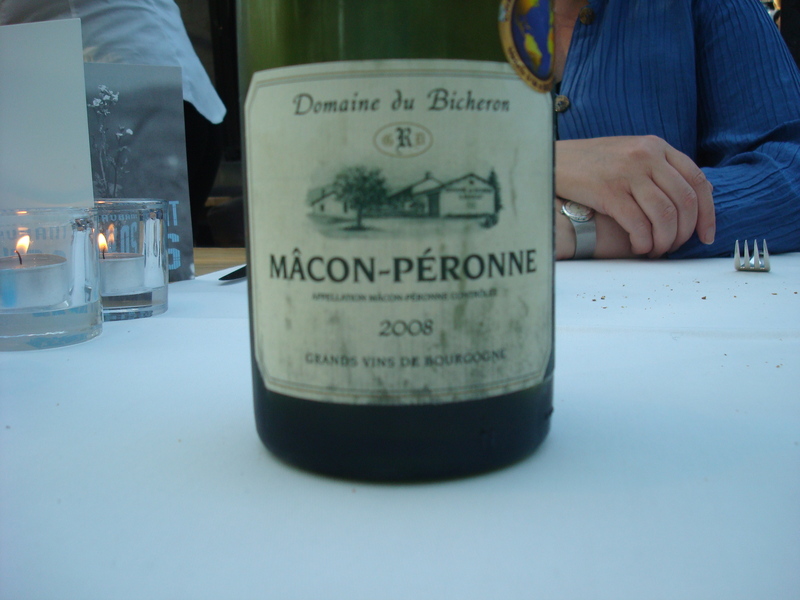 Served with Dumaine du Bicheron Macon Peronne, yet another white Burgundy. Boy, were we glad we tasted this. 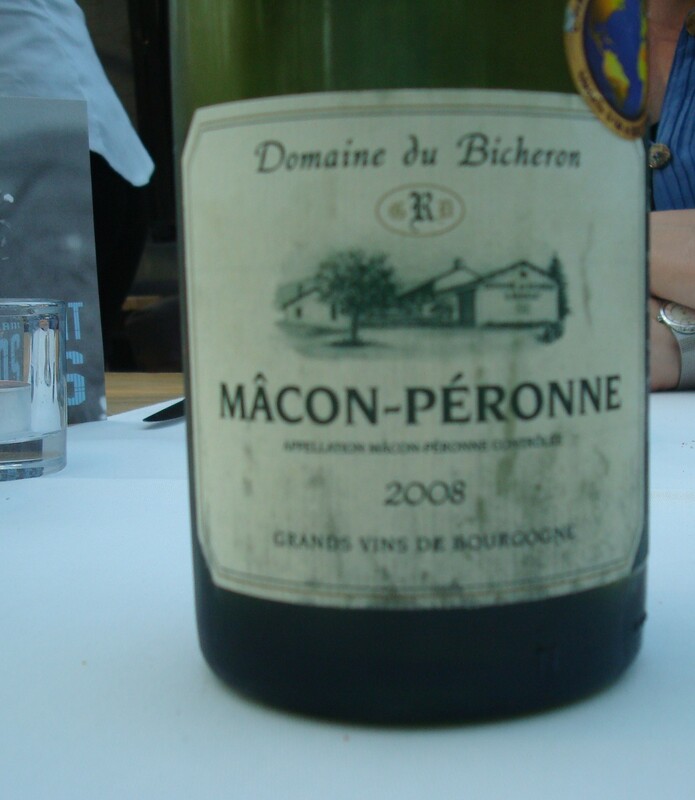 Huge fruit, complex, silky and buttery. I haven’t found it in the US yet, but I will keep looking. 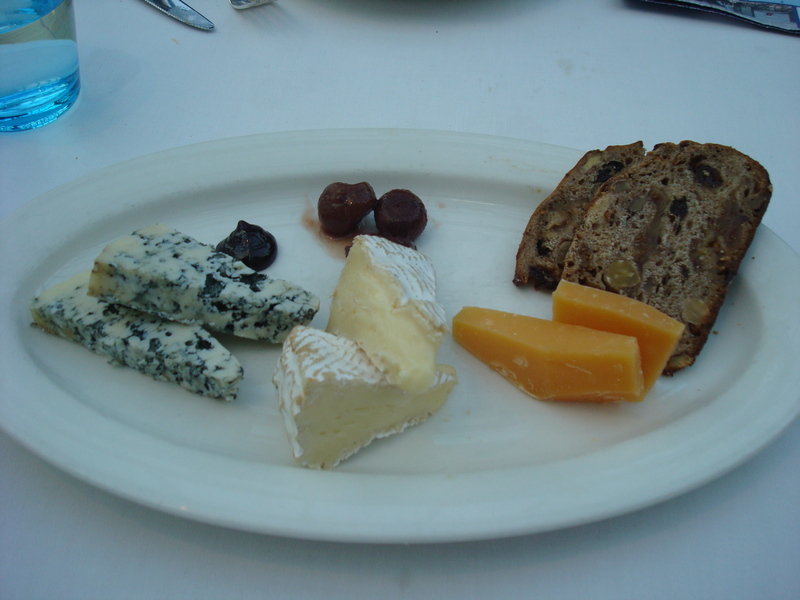 Cheese: We decide we want the optional cheese course. This is a camembert, an aged cheddar and a blue made from sheep, goat and cow’s milk. Served with apple syrup. Very good cheeses. 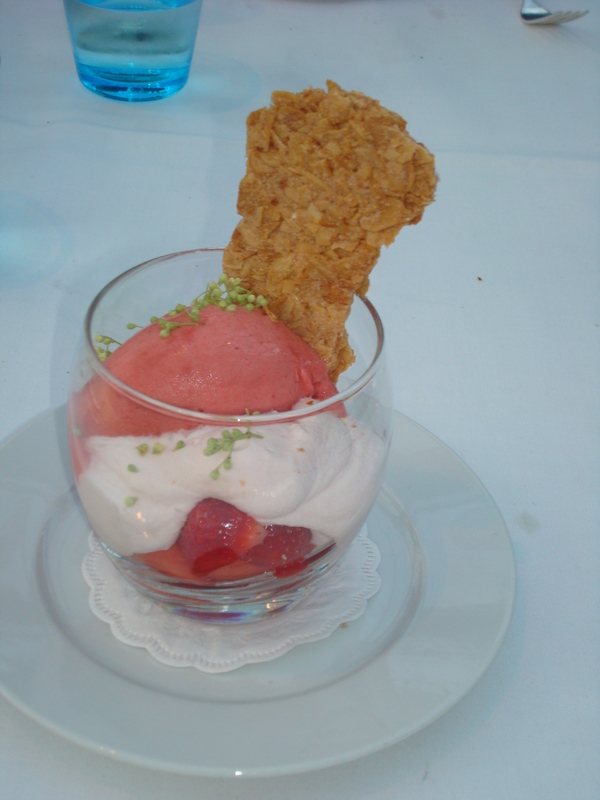 Dessert: Strawberry romanoff with panna cotta, sorbet, and biscuit. Deceptively simple looking. Very complex and delicious. Chef made a non-dairy version for Susan, with Champagne zabaglione. The dessert wine is Marotti Campi Xyris, a sparkling Lacrima, which is just sublime. De Kas was the simplest, freshest tasting gourmet meal of our trip, and the perfect closing meal for this vacation of exotic eating! 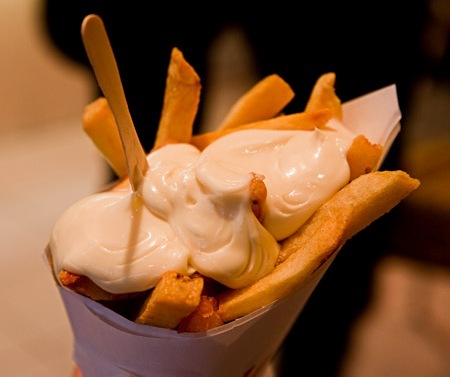 As you walk around Amsterdam, you pick up a paper cone of freshly cooked fries, slathered with a huge amount of mayo (please, not ketchup in Europe), and keep walking. 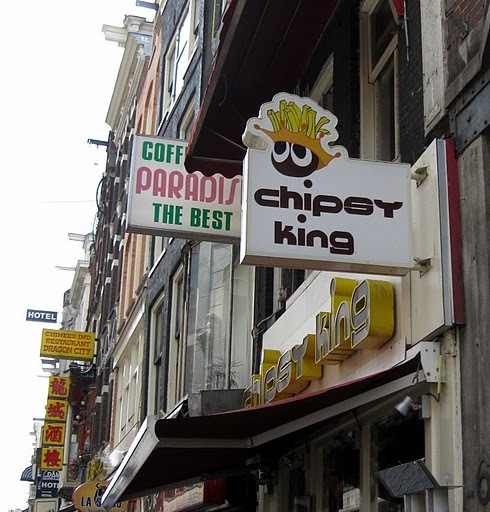 Our selection was Chipsy King. This is next door to a “Coffeeshop”. Hmm. Coincidence? I don’t think so! 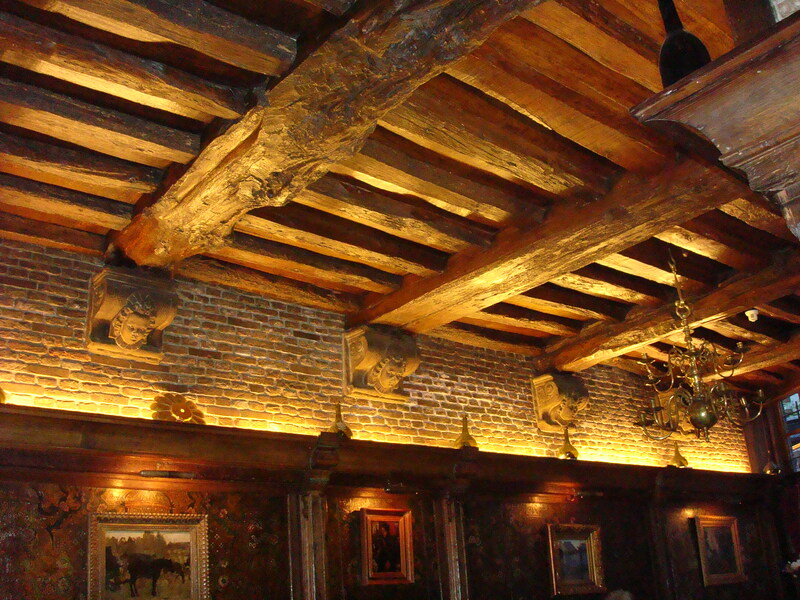 [Although “Coffeeshops” are every 100 feet in Amsterdam – easier to find than the fries!] These were incredibly good. Do not bother with the tiny fork. Use your fingers, lick the mayo off the fingers – part of the fun! 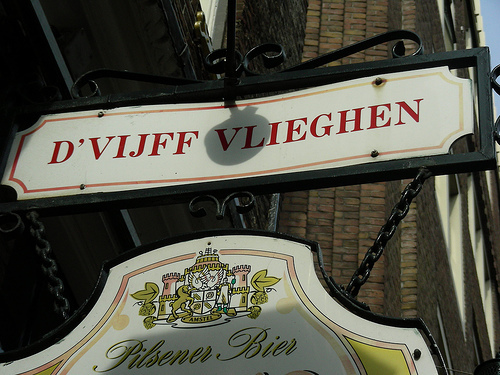 D’Vijff Vlieghen (Five Flies) is an Amsterdam restaurant (recommended by Sharon) with 9 rooms, and a very old world feel and charm. Once more, a tasting menu, with the wine pairing. Amuse Bouche: Green bean mousse with herb foam. 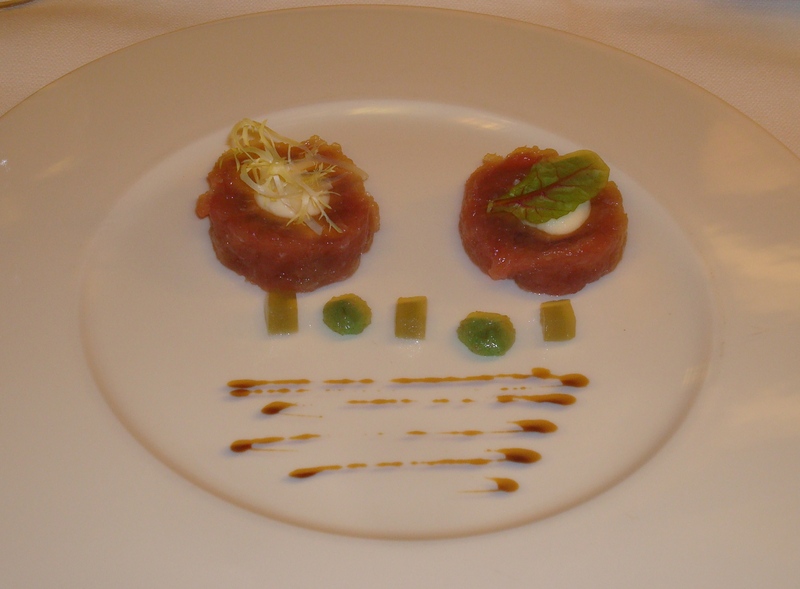 First Course: Tartare of tuna with mousse of celeriac, pickles, and pureed seaweed and wasabi dots, with a balsamico drizzle. This was served with South African Sauvignon Blanc. Very good, but didn’t knock our socks off. 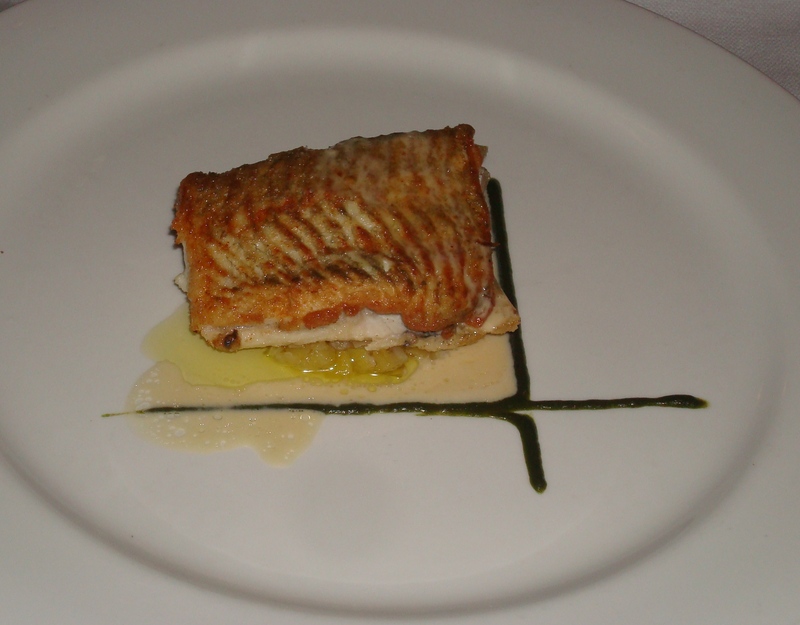 Second Course: Filet of Place (from the North Sea) with caramelized leeks and spinach puree. Served with Joseph Drouhin Pouilly Fuisse 2007. Great tasting fish, but too many tiny bones. Third Course: Pork with asparagus, hollandaise sauce, poached egg. 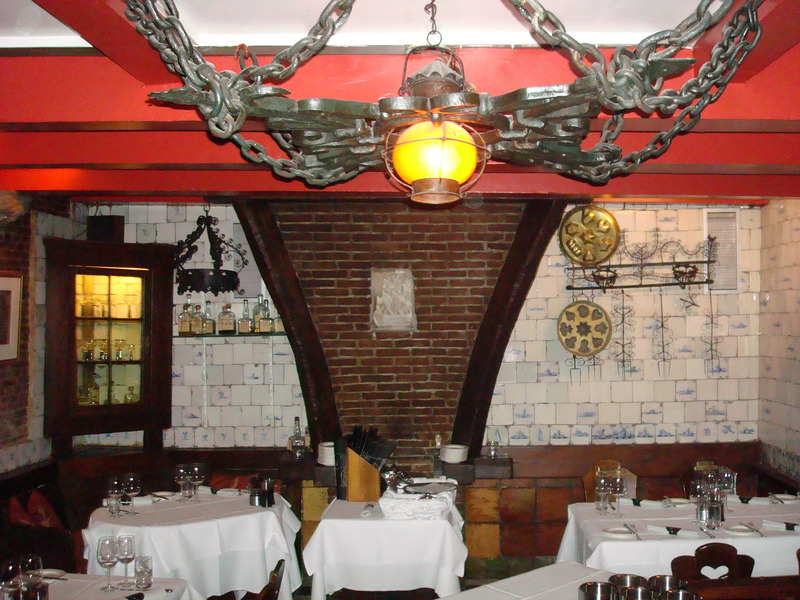 Served with Dutch Cuvee XII – very much like a Reisling. 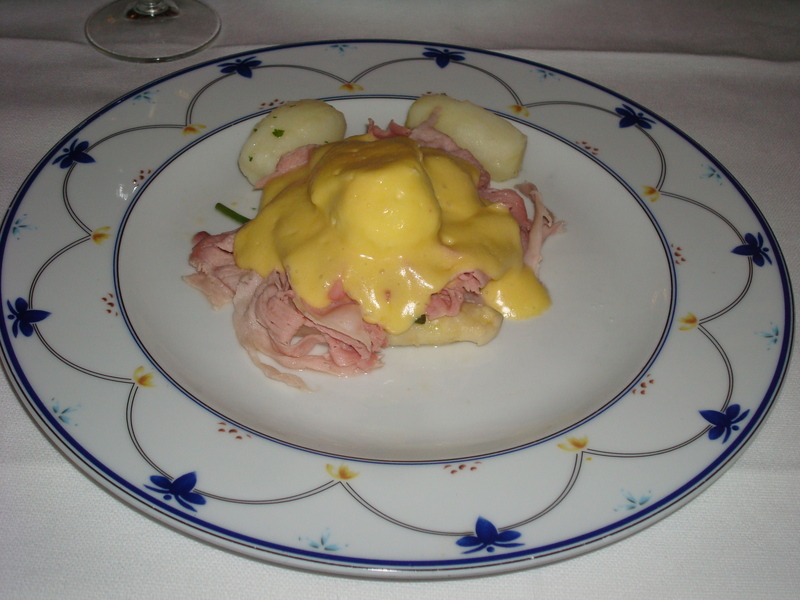 Best ham & eggs we had on this trip! 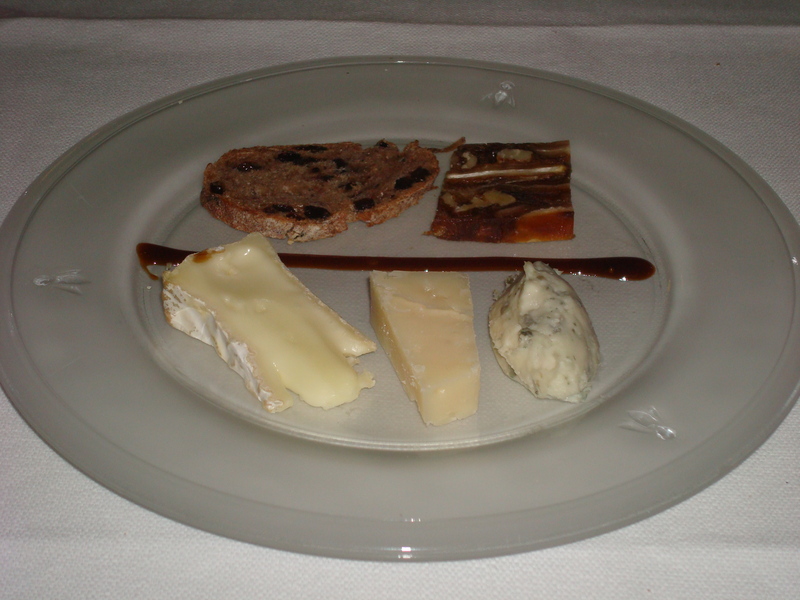 Fourth Course: The cheese course had a brie, goat and blue, served with 2 sweet breads and an apple syrup. This was served with an unidentified but allegedly 15 year old Port. One of the “breads” was really more like compressed fruit, and although the cheese was ordinary (having had much cheese on this trip), the whole thing was great with the wine. 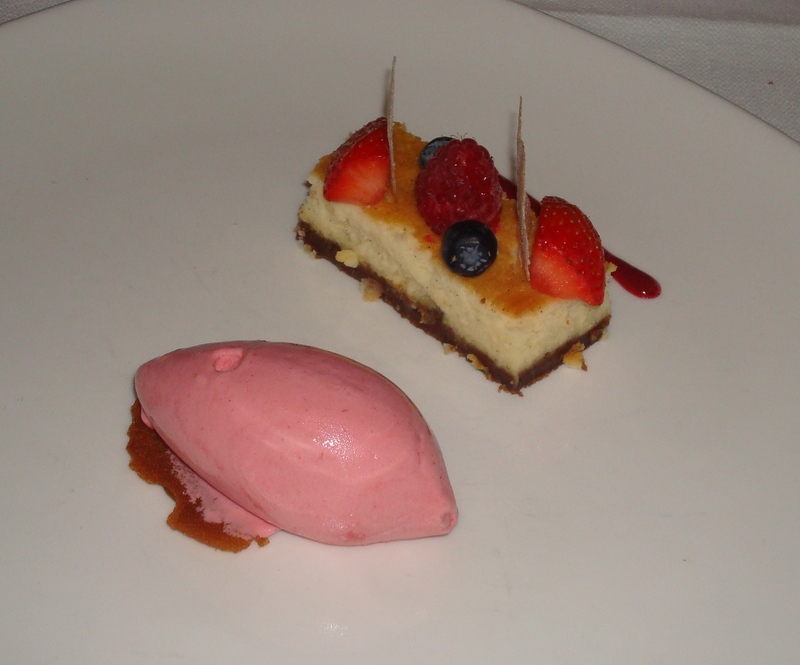 Sixth Course: Cheesecake with berries and raspberry ice cream. Served with Tanaya Muscat from Chile. I found this wine too sweet. On the whole, good food, good service – perhaps we’d already eaten too well in other places on this trip to appreciate it fully.